DUFFY POWER was one of several British vocalists originally signed to the Larry Parnes stable. Having completed a series of pop singles, including 'Dream Lover' and 'Ain't She Sweet,' the singer embraced R&B in 1963 with a pulsating version of the Beatles' 'I Saw Her Standing There' on which he was backed by the Graham Bond Quartet. Power's later singles included 'Tired, Broke and Busted,' which featured support from the Paramounts, but he later joined Alexis Korner's Blues Incorporated together with Danny Thompson (bass), Terry Cox (drums) and John McLaughlin (guitar) who featured on Power's debut album released in 1971. By 1974 Power 'screwed up and penniless' retreated from the music scene. The recordings released by Hux have been rescued and restored from fan archives in addition to the BBC. GRYPHON were formed in 1971 by Royal College of Music students Richard Harvey (keyboards/ woodwinds /mandolin) and Brian Gulland (renaissance wind instruments/bassoon/keyboards/vocals). The group had also comprised Graeme Taylor (guitar/ keyboards/ recorder) and David Oberlé (drums/ percussion/ flageolet/ vocals). With the addition of a bassist, Philip Nestor Gryphon were, by the time of their second album Midnight Mushrumps moving into a more traditional rock style. By 1975 the group had joined Yes on a tour of the USA and the band went through various line-up changes. Taylor had left the group that year (later to join Home Service) and was replaced by Bob Foster; Alex Baird, formally of Contraband, was added as a drummer; and Malcolm Bennett, who had replaced Nestor was, in turn supplanted by Jonathan Davie. The group began to lose its sense of originality, and subsequently broke up in the face of the emerging punk rock explosion. Richard Harvey subsequently found success in the world of commercial jingles and TV soundtracks and has recently been collaborating with classical guitarist John Williams. BACK DOOR originated in late 1969 when Colin Hodgkinson (bass) and Ron Aspery (sax/piano) were playing in a dance band on the south coast and tried out several demos as a duo. Moving to London, Colin joined Alexis Korner's band whilst Ron was involved in session work. The two joined up again, but this time in Yorkshire where they worked as a backing band in Redcar's Starlight Club. They auditioned several drummers, ultimately settling on Tony Hicks. During this period they sent demos to all the major record companies who must have been slightly bemused at the fact this was a trio without a lead guitarist or singer. 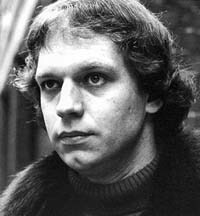 However, Colin Hodgkinson was developing a reputation for his unique playing style in which the bass guitar became a lead instrument. The band's debut album was actually financed by the landlord of the local pub in Yorkshire where they played a regular weekly gig. They circulated the album to the music press and received good reviews subsequently securing the support slot to Chick Corea's Return To Forever at Ronnie Scott's Club. The record companies who had originally passed on their demos then became involved in a signing contest, with Warner Brothers picking up the contract. The band received a lot of critical acclaim for the four albums which subsequently appeared on the label and also for their live work all over USA and Europe. Back Door split in 1976. Ron Aspery followed a successful session career, Tony Hicks moved to Australia and Colin Hodgkinson joined Jan Hammer's band in New York. More recently he has toured with Spencer Davis and with Bill Wyman's band. 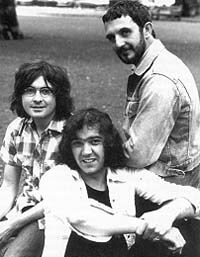 After Manfred Mann had imploded in 1969 the group's latter-day guitarist Tom McGuinness joined up with Hughie Flint who had played with many of the big names on the UK blues scene. Both were heavily influenced by The Band's music and their album 'Music From The Big Pink'. Completing their concept was Dennis Coulson on vocals, Paul Rutherford joined on trombone whilst Colosseum bassist Tony Reeves recommended two songwriters: Benny Gallagher and Graham Lyle. Signed to Capitol Records as McGUINNESS FLINT the band recorded their first album, lost their trombonist but spawned the hit single 'When I'm Dead And Gone' which when released in 1971 only just missed the No.1 slot. The second album 'Happy Birthday Ruthy Baby' failed to produce another hit single and the band had problems reproducing their intricate sound in a live situation. In 1971 Gallagher and Lyle left the band to pursue a successful solo partnership, whilst McGuinness Flint started to flounder although bolstered by their next advance from Capitol. During this period the line-up included ex-Bonzo Dog Doo Dah Band's Neil Innes. 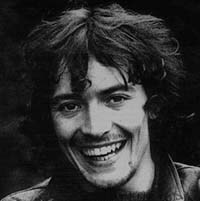 Dropped by Capitol, the band were enticed back by Gerry Bron who had managed the Manfreds in the years before their demise. They recorded two albums for Bron's label, Bronze, 'C'est La Vie' and 'Rainbow' and in spite of recapturing their former sound (with new members Jim Evans on guitar and Lou Stonebridge, ex Palladin, on keyboards and vocals) they finally called it a day in 1975 after Hughie Flint suffered a collapsed lung and it was clear he would be convalescing for some time. ERNIE GRAHAM formed a band called The People together with future Wings guitarist Henry McCulloch in the lates sixties and came under the wing of future Stiff svengali Dave Robinson. With some excellent showcase gigs at key London venues, the group was picked up by Jimi Hendrix's manager Michael Jeffries and - as Eire Apparent - their debut album was co-produced by the master guitarist himself. Dave Robinson had masterminded the Brinsley Schwarz/Fillmore debacle and in its aftermath set up Down Home Management almost a precursor of his Stiffs stable of artists. Ernie Graham briefly became part of the 'Down Home Rhythm Kings' - a sort of management showcase supergroup featuring members of Brinsley Schwarz and Help Yourself who then contributed to his one and only solo album released on Liberty in 1971. In the seventies, Ernie Graham joined Help Yourself and Irish band Clancy and then - like many others of his ilk - succumbed to the phenomenon that was punk. A single was recorded for Stiff Records in 1978, the Phil Lynott song 'Romeo And The Lonely Girl' and the last record he officially released. Ernie Graham died in April 2001.